For this project we had to rethink appointments and the appointment process starting from the different channels. Requirements were to make appointments with KBC easier in general, while catering to the wish to “push” the KBC Live online appointments without interfering with the general customer experience. The standpoint was that online appointments are just as good as regular branch appointments, but the concept was unknown to most clients. 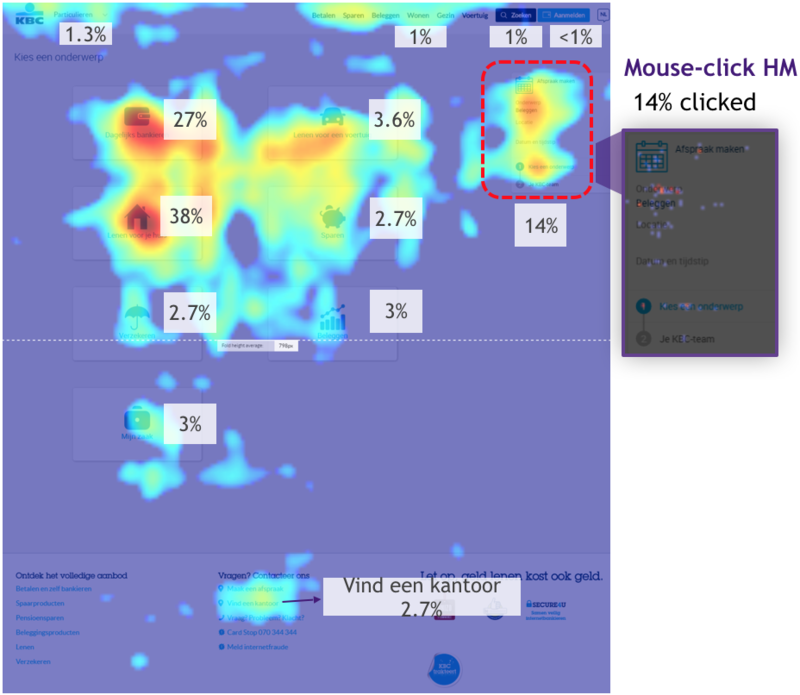 We started from a data report that analysed our site visitor behaviour through analytics, page bounces and heat maps we were able to draw conclusions about the user behaviour. 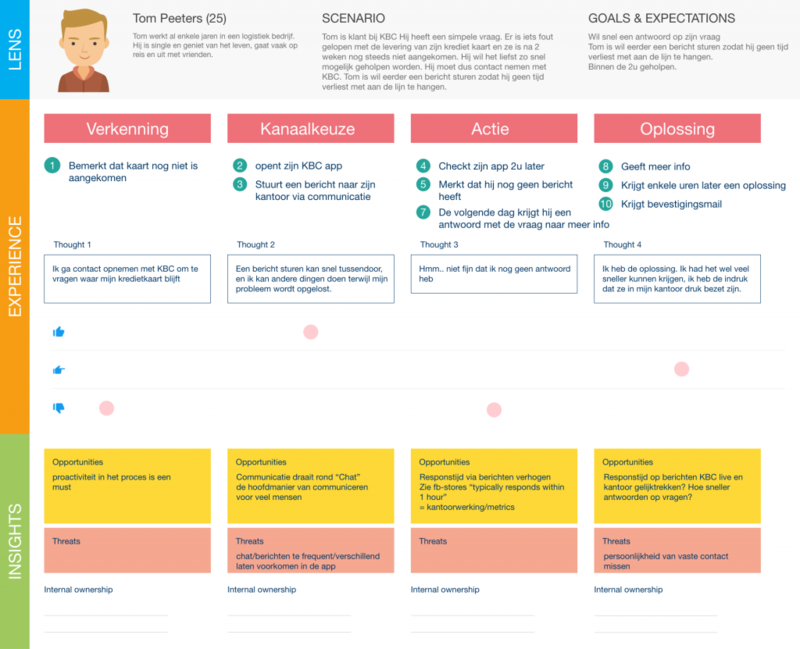 After gaining insight, we built our painpoints overview and set up persona’s and customer journeys. After this we structured the ideal flow and looked at ways to redirect users from all possible entries with the least friction as possible. Obviously there were many bottlenecks and edge cases that came out of this schema. Trying to resolve every one of them was utopian, and we handle all issues with the 80/20 rule, meaning we improve 80% of the problems with 20% of the resources, and are picky on the final 20%, as this often requires alot more work and doesn’t benefit that many users, making the cost/benefit not always attractive. 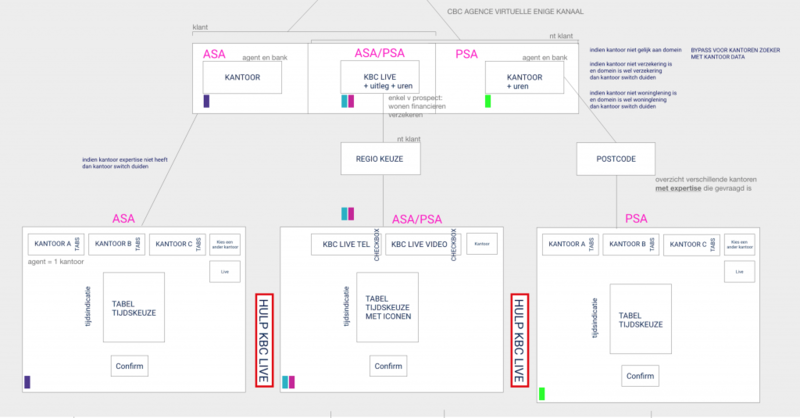 From this scheme we wireframed screens in this proces for mobiles apps, ipad apps, website and mobile web. 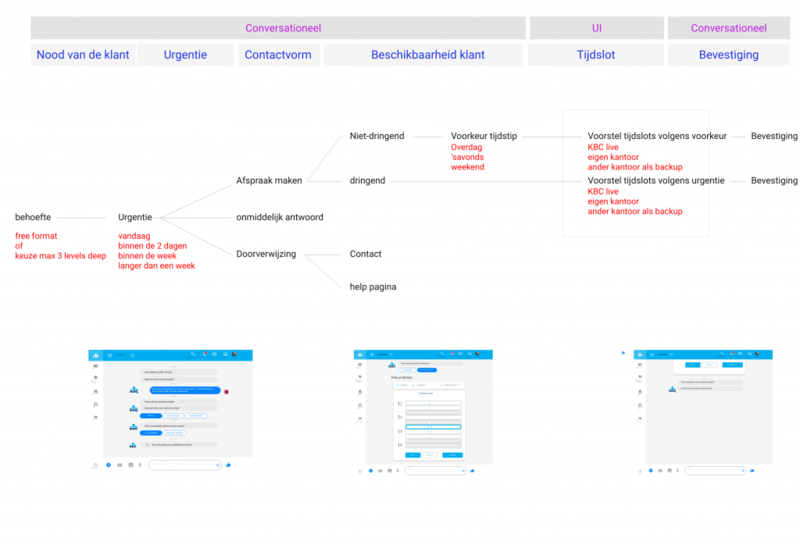 different ideas and iterations were proposed, including a quick selection of the next available timeslot at a certain channel, different ways of organising the “appointment”-button structurally, different ways of timeslot selection, and more. After each wireframing round we discussed the proposal at the Customer Experience Design Board were a panel of designers gave feedback on the wireframe. I also prototyped the wireframes, and organised user tests to check if there were any usability issues. Those included card sorting exercises for appointment subject structuring, guided user tests on-site to see how users understood and reacted to certain scenario’s. We did a total of 4 day-long user tests where we adapted our prototype with some learnings after each session. A slightly adapted version was set up for Website as some vital info included in the authenticated app wasn’t available. After learning that most people still preferred to get an overview of their timeslots before making an appointment, we looked at the mobile story. We experimented with the giving the client a visually attractive screen and tried improving the different meeting times of 1h to 1h30. This was a business limitation that caused the agenda to be divided in 30 min slots. Not ideal in our view. We tried a fresh design that collapsed upon selection of a time to show you one row with your meeting duration. Eventually we also explored a conversational direction, as we were convinced that the needs of the user, being time or location, would be apparent in the posing of the question, and indicate which of these two was more important. The results we came up with was an intelligent interface with smart components that could react to the clients questions, and thus needs. Sadly we didnt have the ability to execute on this idea and had to cut back on the expectations. In the end we improved the interface with the possibility to choose a different branch to make your appointment, a scrolling date picker to increase speed and ease of use, and scrolling timeslots. This also suited relationship managers who could be in different branches on the same day.